Just darned in the ends and pressed these. They are pair number 18. These are the second in a series of three for my Yorkshire friends so the patterns are from the Mary Allen gloves – the first pair has diamonds, this pair has tree of life and the third pair will have the zig-zag pattern on the backs. This pair has been overcomplicated by the fact that I decided to knit them on 2mm needles instead of 2.25s, as I thought that my friend’s hands were particularly small. I’m not sure why I thought this, as they aren’t and then the fingers were too tight and I had to undo one after having her try them on. This is the first time that I’ve actually had to pull back any significant amount of knitting in this type of glove. 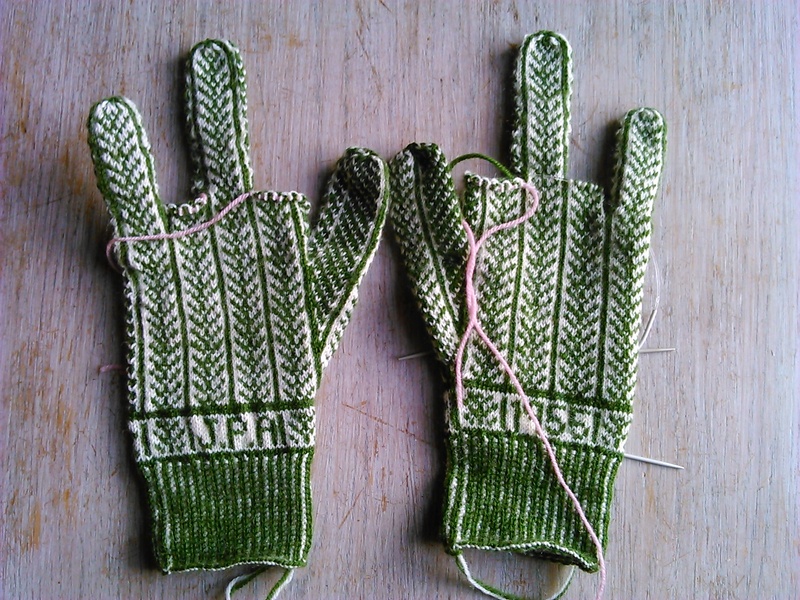 I knew I was unlikely to have enough of the green wool and I had more lined up for the other fingers but I really struggled to carry on once it had run out. It’s such a beautiful colour that I was reluctant to substitute it. However, if I knit in vintage wools that’s what happens when there’s only one ball. For the next pair I’m going to knit the fingers in a slightly different shade than the hands so I don’t have to make hard decisions half way through. Once I’m unhappy or uncertain about something it slows me right down and I have to force myself to keep going. However, having said all that, these are a lovely pair. I like the colours and I think that the other greens in the fingers work ok. I think my friend will like them. Because I don’t have enough wool to do all the fingers in the darker green, alternate ones will be in white and a lighter green. I had to knit the middle fingers so that I knew for certain that there was not going to be enough wool for any more fingers. Yes, that’s correct , it’s raining in the East Bay region, only the second time in several months. Living in Yorkshire, and not being that fond of getting wet I am trying to be brave about this, and failing miserably. So far, it’s been a day inside and a good chance to catch up with Judy’s gloves, which I would like to have complete, or almost, before going home next Wednesday. And now one has an almost complete thumb and the other has the stitches all in place for the thumb to get started. The pair in progress for my friend JPA are coming on nicely. The green and white look very striking and I’m knitting them on 2mm needles so they are slightly smaller than usual. The outline round her hands is small and her little finger starts really low so there’s not much knitting round the hand above the thumb. I’ve started the little finger on one hand and I’m using magic loop with an 80 cm circular, trying out one of the economy range from Knit pro at Purl City Yarns, Manchester. I also think that I might just have enough to knit all the fingers in the dark green, although I have brought a ball of a lighter green with me if the dark runs out. There’s other news too which is going in a separate post. I’m up to the thumb on these. Very happy with them.